You can either make a booking directly on this website by using the "check availability box" to the left. Or you can call our office at 406-548-5241 and we will be glad to help you. What if something gets broken while I am staying in the property? The CSA Damage Waiver covers up to $1500 for accidental damage with no questions asked. Reservations canceled 31 + days prior to your arrival date will be fully refunded, minus a $50 cancelation fee. Reservation balances are to be paid in full 30 days prior to the arrival date and become 100% non-refundable at that time. Please note: Reservations made thru Airbnb.com have different policies on cancellations. Please refer to Airbnb.com. Travel insurance not only covers the cost of the vacation rental during your trip but can also cover the cost of your airline tickets, and covers the days you are traveling. Whether driving or flying, travel insurance covers you the minute you leave your home to the time you return. All Cozy Creek Vacation Homes use keyless entries, therefore no need to pick up keys. The 4 digit code will be emailed to you in FINAL INSTRUCTIONS five days prior to your arrival date. Do you know of any good restaurants? You bet! Just look under 'Restaurants and Bars' under 'Plan Your Trip' on this website or give us a call. We would be happy to recommend great places to eat or any other services you are looking for in the area. 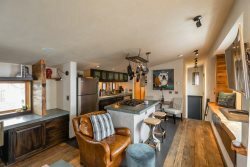 Bozeman is a super dog-friendly town therefore, we offer several homes that are pet friendly.. You can either look at our properties online by clicking on the "vacation rentals" tab above and see if the home you are looking at allows pets. Or you can call our office at 406-548-5241 and we would love to help find a home that is just right for you and your pet.